The Ionia County Commission on Aging with Sparrow Ionia Hospital and Sparrow Ionia Physical Therapy presents the special learning event: No Falls Day! 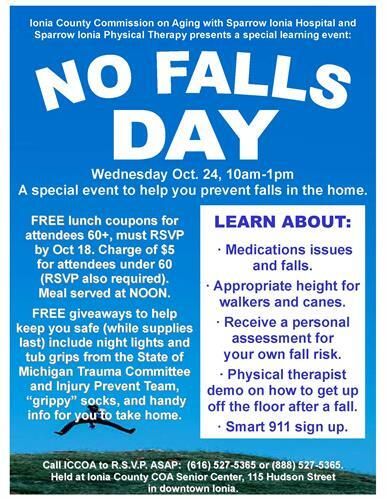 Taking place on Wednesday, October 24th from 10am - 1pm, this special event will help you prevent falls in the home. FREE lunch coupons will be made available to attendees 60+ who RSVP by October 18th. For attendees under 60 there will be a charge of $5 (RSVP also required). The meal will be served at noon. There will be FREE giveaways to help keep attendees safe (while supplies last), including night lights and tub grips from the State of Michigan Trauma Committee and Injury Prevent Team, "grippy" socks, and handy information for you to take home! Call the ICCOA to RSVP: 616.527.5365.